Carnegie's Anthony Piro was part of a Caltech-led team of astronomers who observed the peculiar death of a massive star that exploded in a surprisingly faint and rapidly fading supernova, possibly creating a compact neutron star binary system. Piro's theoretical work provided crucial context for the discovery. Their findings are published by Science. 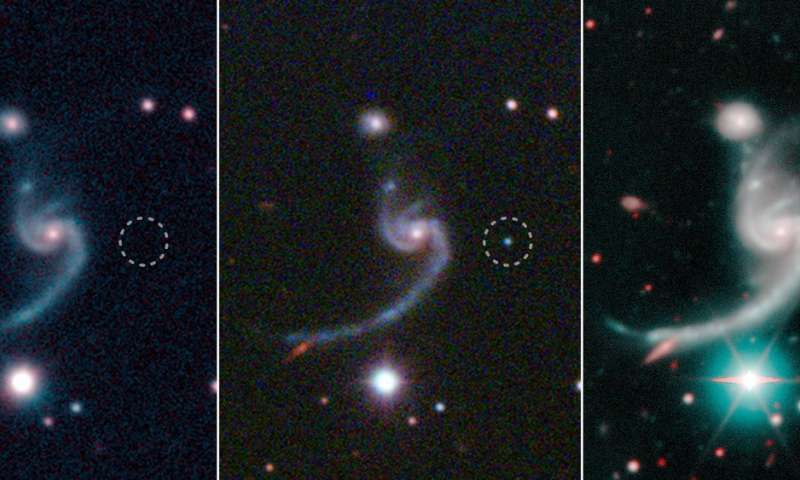 Observations made by the Caltech team—including lead author Kishalay De and project principal investigator Mansi Kasliwal (herself a former-Carnegie postdoc)—suggest that the dying star had an unseen companion, which gravitationally siphoned away most of the star's mass before it exploded as a supernova. The explosion is believed to have resulted in a neutron star binary, suggesting that, for the first time, scientists have witnessed the birth of a binary system like the one first observed to collide by Piro and a team of Carnegie and UC Santa Cruz astronomers in August 2017. A supernova occurs when a massive star—at least eight times the mass of the Sun—exhausts its nuclear fuel, causing the core to collapse and then rebound outward in a powerful explosion. After the star's outer layers have been blasted away, all that remains is a dense neutron star—an exotic star about the size of a city but containing more mass than the Sun. Usually, a lot of material—many times the mass of the Sun—is observed to be blasted away in a supernova. However, the event that Kasliwal and her colleagues observed, dubbed iPTF 14gqr, ejected matter only one fifth of the Sun's mass. "We saw this massive star's core collapse, but we saw remarkably little mass ejected," Kasliwal says. "We call this an ultra-stripped envelope supernova and it has long been predicted that they exist. This is the first time we have convincingly seen core collapse of a massive star that is so devoid of matter." Piro's theoretical modeling guided the interpretation of these observations. This allowed the observers to infer the presence of dense material surrounding the explosion. "Discoveries like this demonstrate why it has been so important to build a theoretical astrophysics group at Carnegie," Piro said. "By combining observations and theory together, we can learn so much more about these amazing events." The event was first seen at Palomar Observatory as part of the intermediate Palomar Transient Factory (iPTF), a nightly survey of the sky to look for transient, or short-lived, cosmic events like supernovae. Because the iPTF survey keeps such a close eye on the sky, iPTF 14gqr was observed in the very first hours after it had exploded. As the earth rotated and the Palomar telescope moved out of range, astronomers around the world collaborated to monitor iPTF 14gqr, continuously observing its evolution with a number of telescopes that today form the Global Relay of Observatories Watching Transients Happen (GROWTH) network of observatories. It looks rather like an odd shrimp. Yes--that's how science works. In fact that's how human understanding of the world works--including your's. We start with a conjecture about something, then look for evidence that we can rely on it to be true. That may be a correct assumption but it does not mean the answer is correct alla the headline. Presumption does not make it true. "A hot and fast ultrastripped supernova that ***likely*** formed a compact neutron star binary." That may be the title of the paper but it is not the headline of the above piece. "Massive star's unusual death heralds the birth of compact neutron star binary"
And, as I never tire of pointing out, you should read the papers, not the fluff provided in press releases. Admittedly, some papers are paywalled, but 'science by press release' is not a good thing to do. It is typical of cranks - in particular, electric universe cranks. Not that I'm accusing you of being a crank. The authors of the paper do not write those headlines. That is usually done by the institution's PR team, who are most likely not even qualified in the relevant science. That agaim may be true,but somewhere a line must be drawn.If this was talking about a person it would be be subject to slander or libel laws,but as it is cosmology anything goes.It is not how science works. No, it wouldn't. The article is not a scientific paper. The paper is a scientific paper, and they are careful to use qualifying language. Such as 'likely', 'probably', etc. And there results are based on previous observation, and reasonable inferences. Sorry JD.clicked the article,couldn't get past the paywall or whatever. No, it is based on previous observation, and reasonable inferences. What would you have them do? Sit on it, until someone beats them to it? No, the best thing to do is put it in the scientific domain, where other scientists can assess it, model it, make their own observations, and either support or challenge it. Seems perfectly reasonable to me.